Speaking strictly, Banking means the taking of money on deposit (banks of deposit), and loaning it out on interest (banks of issue). In this sense Banking is comparatively recent; only a few banks of deposit existing in the Middle Ages, in Italy (Florence, Genoa, Lucca), while the earliest banks of issue of consequence were those of Amsterdam and Hamburg at the beginning of the seventeenth century. The financial activity of the Jews in the Middle Ages is generally called Banking; but this is erroneous, as they did not receive money of others on deposit, which is an essential element of Banking. Their operations were more of the nature of finance banks—that is, loan corporations—and were conducted under special economic conditions and relations to the state (for further particulars see also the article Usury). All the great Jewish financiers of the Middle Ages, such as Aaron of Lincoln and Aaron of York in England, Jahudan Cavalleria and Benveniste da Porta in Aragon, Esmel de Ablitas in Navarre, andNathan Official in France, were associated with the royal treasuries of their respective countries, and in every instance their property fell into the hands of the crown; so that their banking operations were in the nature of indirect taxation. Details are not sufficiently clear to make a general statement. In several cases, however, the capital utilized by these financiers probably belonged in some measure to other Jews; so that their operations were really in the form of banking corporations, though the conditions were so dissimilar from those of modern Banking that it would be misleading to treat them as of the same order. In more modern times the financial operations of Jews have been more of the order of finance loan corporations than of banks of deposit and issue; but as a large part of the business of modern Banking consists of similar loan operations, there is less impropriety in using the word for the modern form of Jewish financial transactions (see also Finance, Stock Exchange). With the spread of the Maranos throughout the world-empire of Spain and Portugal (which countries were united 1580-1640), Jewish commerce entered a new phase, which is represented by the career of Don Joseph Nasi, who began his life as a banker in the firm of Mendes at Antwerp, the center of Spanish commerce. The Maranos became large factors or merchants, and, owing to the unwise economic policy of the Spanish monarch, were enabled to accumulate large capital from the profits of importation into Europe of the raw products of the East and West Indies. The firm of Gradis at Bordeaux, a branch of the Mendes family, established relations with Amsterdam as well as with the New World; so that ultimately they became the chief exporters from France to Canada (9,000,000 francs during the Seven Years' war), besides maintaining relations with the Maranos in Spain itself (Jacobs, "Sources," No. 13, p. 5; Grätz, in "Monatsschrift," new series, vii.-viii.). But among the chattels imported by such merchants was bullion; and thus their operations as merchants led to their activity as bankers. Ferdinand de Carvajal is thus reported to have brought into England no less than £100,000 per annum ("Trans. Jewish Soc. England," ii. 18). During the latter part of the seventeenth century and the early part of the eighteenth, a number of Marano merchants are found acting as loan agents for European monarchs. Thus Isaac Suasso, Baron Auvernes de Gras, is said to have advanced 2,000,000 florins to William of Orange for the invasion of England. With the great movements of Continental armies in connection with the wars of Louis XIV. large fortunes were gained by the Jews as commissaries; and these were then loaned out in banking operations. Thus, on the one side, Marlborough's troops were supplied by Sir Solomon Medina ("Dict. National Biography," x. 336) and Joseph Cortisos; while Jacob Worms performed a similar office for the opposing army of Louis XIV. Worms afterward settled in Paris as a banker (Kahn, "Histoire des Juifs à Paris dans la XVIIIe Siècle," p. 39). Meanwhile in Hamburg a bank had been opened in imitation of the Amsterdam bank; this still exists under the name of the "Hamburger Bank." Among the chief founders of the new venture was a Marano named Diego Teixera de Mattos; and of the forty original members of the bank twelve were Jews. (Grätz, "Gesch. der Juden," x. 17, note). Later on, in connection with the Hamburg bank were the two Abensurs, financial representatives of the king of Poland. They represent another source from which Jewish capital was drawn; the position of the Jews as "factors" to the Polish nobility in some degree resembling the standing and functions of the Court Jews who slowly collected around the smaller German courts and who managed their finance much in the way modern banks do in the case of court estates. Among these may be mentioned Michael of Berlin, court Jew to Joachim II. of Brandenburg (Grätz, ib. ix. 305, 314); Samson Wertheimer at Vienna, and Bassevi von Treuenberg at Prague (the last two connected with the imperial finances of the Hapsburgs). In the middle of the eighteenth century the Pintos, Delmontes, Bueno de Mesquita, and Francis Mels of Amsterdam were the leading financiers of northern Europe; while in London, which, owing to the relations of William III. with Holland, was financially dependent on Amsterdam, Mendes da Costa, Manasseh Lopez, and Baron d'Aguilar held prominent positions. The very first work on the operations of the Amsterdam Exchange was written by a Spanish Jew named Joseph de la Vega. When French influence became prominent in Holland in 1803, the financial operations of the powers opposing Napoleon were transferred to Frankfort-on-the-Main (Ehrenberg, "Das Zeitalter der Fugger," ii. 318), and the financial control of the anti-Napoleonic League fell into the hands of Mayer Amschel Rothschild, court Jew of William I., elector of Hesse-Cassel. His father, Frederick II., had died in 1785, leaving about £8,400,000, derived chiefly from the hire of soldiers to the British government to suppress the rebellion in America. As the fortune of the Rothschilds was ultimately dependent on the manipulation of this, it is curious to reflect that their financial predominance in the nineteenth century is in the last resort due to America. It is impossible in this place to pursue the financial career of the Rothschilds, which is the key to the history of Jewish Banking in the nineteenth century; but it may be remarked that the London house between 1818 and 1832 undertook loans amounting to £21,800,000, and that as early as 1824 the Paris house had risen to the position of financial magnates, undertaking in conjunction with Lafitte and Baring the French loan of 1824 (Nervo, "Les Finances Françaises sous la Restauration," ii. 294). (For the ramifications built up by Mayer Amschel Rothschild throughout western Europe, see Rothschild.) The plan adopted by him of establishing branches in the more important European capitals, over which he placed his sons, was followed by other Jewish banking-houses. With the reconstruction of Europe, after the fall of Napoleon in 1815, a new financial era began inwhich the capital hitherto diverted to warlike operations was transferred to industrial enterprise, owing to the introduction of steam. This was mainly operated from London with English capital; and the Jews did only a small portion of the business connected with the introduction of machinery and railroads into European commerce. But the international connections of great Jewish families, such as the Rothschilds, Sterns, Péreires, Hirschs, and Bischoffsheims caused them to be of considerable importance in the issuing of state loans between 1820 and 1860. Up to 1848 the practise of apportioning loans to large banking firms, who then distributed them to the public in smaller lots, was carried out; and in this way the Rothschilds especially had a quasi-monopoly of the loan market. In the fifties, however, their monopoly of international finance was broken down by the formation throughout western Europe of credit banks, many of them founded by associations of Jewish bankers of smaller caliber than the great financial families. Thus the Crédit Mobilier of 1852 was founded by the Péreires, Solomon Heine, and D'Eichthal (M. Aycard, "Histoire du Crédit Mobilier," 1867). The practise, after the year 1848, of opening the subscription to the loans to the public in general also tended to break down the monopoly of the great Jewish financial firms. It may be worth while to remark here that the idea promoted generally by anti-Semitic writers that the resources of all Jewish capitalists formed one fund is ludicrously at variance with the facts of the case. Heine, in a correspondence to the Augsburg "Allgemeine Zeitung," dated May 27, 1840, and reprinted in "Französische Zustände," refers to Rothschild and Fould as two "rabbis of finance," opposed just as strenuously to each other as were once "Rabbi Shammai and Rabbi Hillel in the old city of Babylon" (sic). Jewish firms competed with one another with as much eagerness as they did against non-Jewish firms. The Péreires, for example, obtained a concession for South Russian railways against the Rothschilds in 1856 (Reeves, "The Rothschilds," p. 334). With the introduction of railroads on the Continent many of the firms previously mentioned were closely connected, the Péreires with those of northern France, the Bishoffsheims with those of Belgium, and Baron de Hirsch with those of Turkey. Many Jewish firms and credit banks, especially the house of Bleichroeder, were concerned with the growth of railways in Germany and Austria. It was Baron Bleichroeder who operated the transfers of the milliards from France to Germany after the Franco-Prussian war. But with the nationalization of the German railroads the field of operation of the Jewish banking-houses in Germany was transferred from railroads to other industries which they have largely helped to create. Throughout the latter half of the nineteenth century, however, others had been learning the secret of international connections, and by 1900 the monopoly of international finance had largely passed from Jewish hands. An organized attempt to precipitate this was made about 1885 by a number of Catholic financiers in France, who constituted the Union Générale to overcome the financial predominance of the Jewish capitalists (Rothschilds, Pereires, etc. ); but it proved a disastrous failure, and much of French anti-Semitism has been traced to this cause. Similarly, it is stated that the financial crisis of Germany and Austria in 1873, in which the inflation due to the introduction of the milliards came to an end, was also a source of anti-Semitism, because the shrewdness of the Jewish bankers had foreseen the crash, and they were enabled to evade it. After the Crimean war, Jews contributed largely to the development of Banking in Russia; Barons Joseph and Horace Günzburg and Leon Rosenthal, of St. Petersburg, organized many commercial banks, and placed government loans in the German and French money-markets. The Kronenbergs and Ivan Blioch, of Warsaw, as well as Efrussi and Rafalovich, of Odessa, should be mentioned in connection with Russian banking. 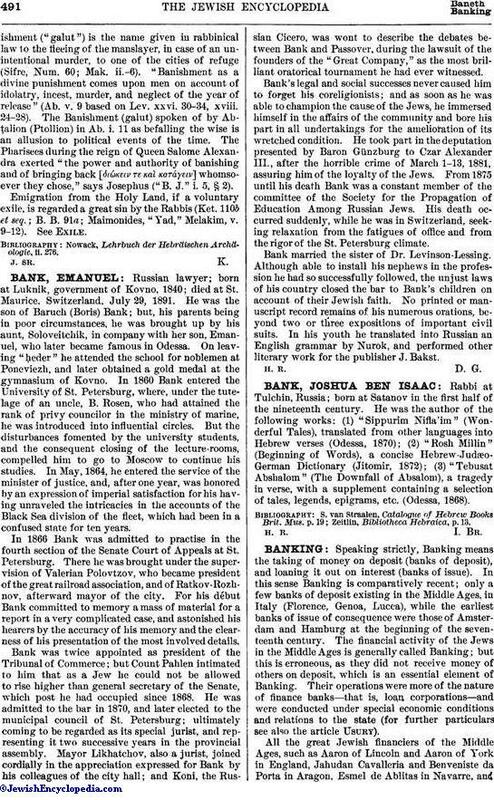 Attention may be drawn to one side of Italian Banking with which the name of a Jew is prominently connected, though he himself is not a banker. The finance minister Luigi Luzzati introduced into Italy about 1864 the Schultze-Delitzsch method of agricultural cooperative banks. This system has been very effective in helping the Italians to tide over times of distress, and has quite revolutionized the condition of Italian agriculture. In the United States there has never been any marked influence of capital controlled by Jews either on the stock exchanges or in the great industrial connections, the opportunities for international connections being only slight. 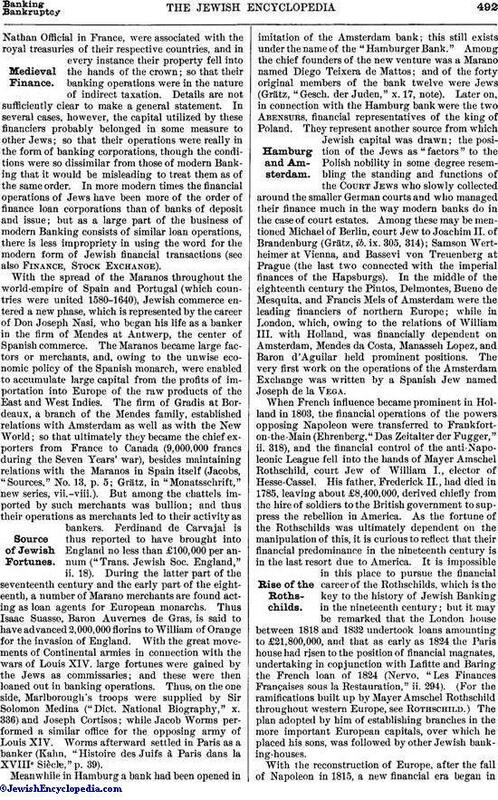 But in the two great wars Jewish financiers played a considerable rôle, owing doubtless to their European connections: Haym Solomon in the Revolutionary war (see "Transactions of the Jewish Historical Society of America," passim), while Seligman Bros. and Speyer & Co. financed the North, and Messrs. Erlanger the South (J. C. Schwab, "Confederate States of America," p. 102, New York, 1901), in the great Civil war. More recently, in the great development of railway finance, the firm of Kuhn, Loeb & Co. has taken a prominent position. 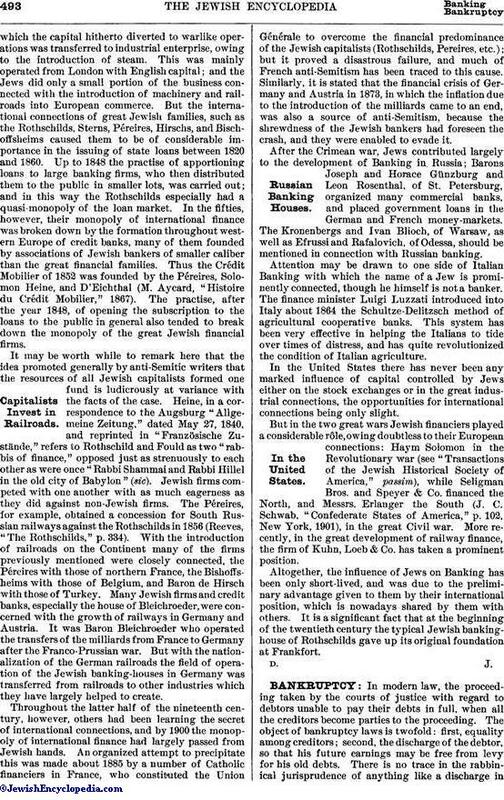 Altogether, the influence of Jews on Banking has been only short-lived, and was due to the preliminary advantage given to them by their international position, which is nowadays shared by them with others. It is a significant fact that at the beginning of the twentieth century the typical Jewish bankinghouse of Rothschilds gave up its original foundation at Frankfort.